There are some that maintain JFK erred when he said “Ich bin ein Berliner” – that the addition of the ‘ein’ turned ‘I am a Berliner’ into a ‘I am a jam doughnut’. Nothing could be further from the truth, as what he actually said was “I am a Berliner in spirit’, and you can be too via a visit to Von Fressen, and as an added bonus enjoy their jam – a tasty tomato variety! When Von Fressen opened its doors six and a half years ago, the founders wanted to recreate the same atmosphere they fell in love with in Prenzlauer Berg, one of the coolest districts of Berlin. 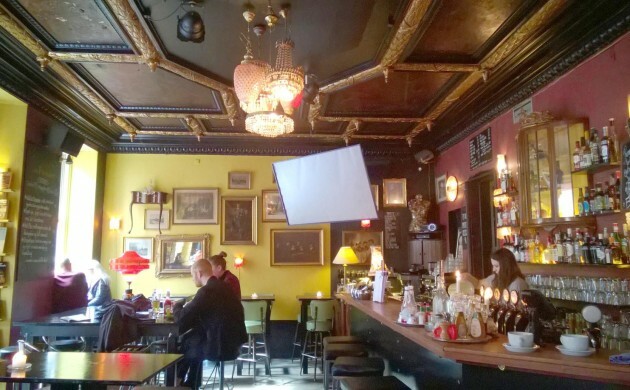 They’ve duly incorporated the eccentric style of the German capital’s bars into their Vesterbro café – and as soon as you come in, the interior decoration they’re famous for launches an all-out assault on your senses. And there’s no escape! Raise your head, and a dark ceiling with golden decor will leave you mesmerised. You’ve just stepped into Von Fressen’s world! We take a seat in an adorable corner of the café where we are immerged into ornate surroundings. Old paintings of all kinds – religiously themed, ancient portraits – photos and mirrors decorate the walls, each of them coloured differently. Ermanno, the manager, warmly welcomes us and introduces us to the café’s simple and clear values: to serve fresh and homemade food to all its clients. We order two brunches: a vegetarian and a vegan. The menu also has a meat option, as well as a wide range of breakfast dishes. But first things first. We are Italians and we need to start our day with an espresso. The taste of the coffee is great, but surprisingly, although it has an undeniably Italian fragrant aroma, it is roasted not far from the café in Amager. “Relying on Danish suppliers brings a savory fresh taste to our products, and this is extremely important for us,” explains Ermanno. The rich visual details of the place gladly entertain our watchful eyes; however, as soon as the brunches appear, we shift our interest to the mouthwatering specialties. My vegetarian brunch incorporates a huge range of delicious flavours. Sipping organic orange juice, I start with soft scrambled eggs served with grilled vegetables, tomato, cress, potatoes, a radish salad and cottage cheese. My need for salt is indulged by delicious quinoa and a chickpea burger with tomato jam, served with organic bread and butter. A palate-cleaning glass of creamy Greek yogurt with organic honey and homemade granola sets me up for a grand finale to complete the yummy experience with a delicate thyme and blueberry pancake. Similarly, the vegan brunch presents quinoa and a chickpea burger with tomato jam, grilled vegetables, tomato, cress and a vegan potato salad on rye. Moreover, the dish includes a gentle hummus and olives, as well as a range of fruit, including oranges and grapes, and a refreshing elderflower-mint lemonade. We conclude our morning meal greatly satisfied: we felt the warmth of home-made food and appreciated the variety and the care it was prepared with. 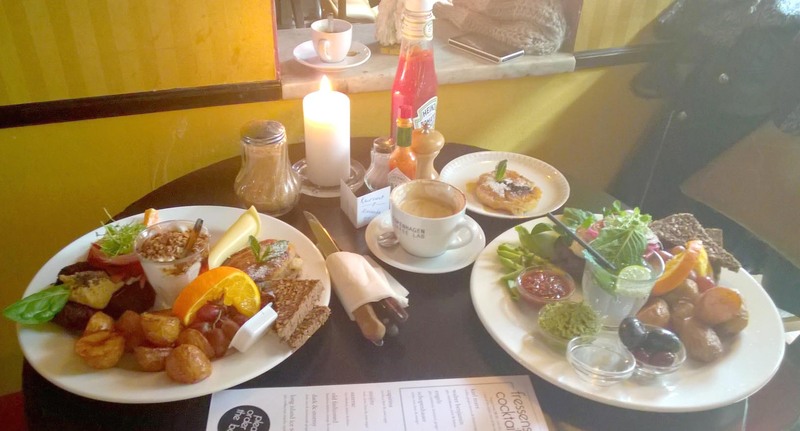 Von Fressen is absolutely the right place to start the day with its wunderbar brunch!